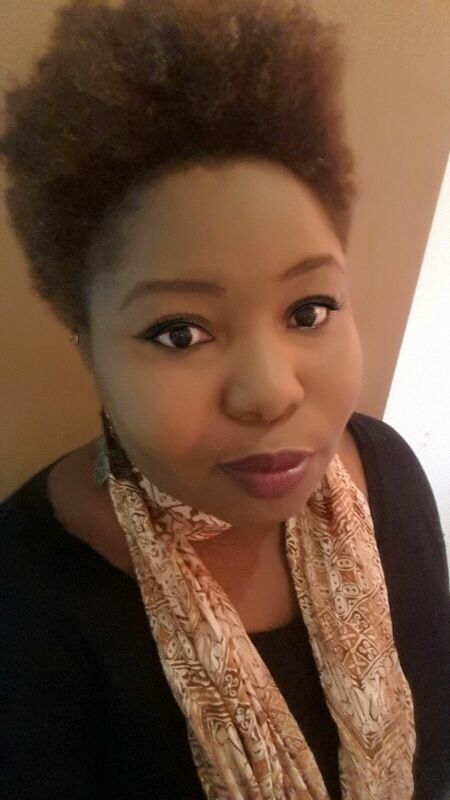 When did you start your natural hair journey: Funny story, this is my second natural hair ‘journey’! I started for the very first time in August 2012. I think at that time I was more concerned with what was in fashion, it was chic and in and so I wanted it too, I went to a barber and had him shave my head completely, it was quite eventful. People asked all kinds of questions like, “How did you know your head wasn’t irregularly shaped?” I thought that was the funniest! Anyway, that ‘journey’ didn’t last very long. In 2014 I reverted to the creamy crack because I was tired of the work that I had to put into maintaining my natural hair. I was also tired of people sticking their fingers in it and the snide comments I got particularly from men about my mane. It didn’t take long for me to regret this decision. So in December 2014 I started again, transitioning this time around. So once again, I’m on the ‘journey’, but for a better reason. Why did you: I started again because I realized that my hair is healthiest in its natural state. This is tried and tested really… It may be a bit challenging to manage, but it’s definitely worth it! What products do you use: This time around I’m much better with product use… First, I don’t use shampoo, simply because it dehydrates your hair. So for washing (which I do whenever) I just use conditioner, mostly volumizing. Brand really doesn’t matter, from V05 to Tresemme, the job gets done. I also detangle my hair this way; I never comb my hair out if it’s not saturated in conditioner. For everyday use, I have a mixture of leave in conditioner, Jamaican Black castor oil, coconut oil, water, tea tree oil, and sometime jojoba oil. I use a spray bottle that I got at a Chinese department store for just $200 GYD to spray this in daily. It really helps to keep my hair moisturized and protects from breakage from the excessive heat or even the cold from being in an air conditioned room all day. To keep my mane healthy I give it lots of love! I don’t allow anyone to pull and thug at it (hairdressers like to do this). I also try not to be too adventurous with products as this can over process your hair. Biggest challenge: The biggest challenge with natural hair is that it tends to be the topic of discussion once you’re in the room. There’s always that one person who’ll touch your hair (most annoying thing ever!) or tell you how much they love it, or talk about how ‘good’ your hair is. While I’m not about being politically correct where hair is concerned, I hate that it draws so much attention, and people seldom know what to say. Other than that, I think it’s hard to be patient with your natural hair, but it’s necessary. I really think that if you love it, it’ll love you back. How does your hair make you feel: My natural hair makes me feel like I’m more of myself. Somehow it exposes a layer of authenticity that feeds right into my ego, LOL. Let me make it clear that women with relaxed hair aren’t false; it’s just that wearing my natural hair works for me. Advice to other naturalistas: My advice to other natural sistas is: 1. don’t use shampoo! 2. Do what works best for you; In its own way, your hair will tell you exactly what it needs. 3. Don’t listen to the 101 things that people have to say, everyone has advice to give. 4. Love your hair! If you wish to share your story as a “Naturalista” please send your responses to these questions to maglyfemagazine@gmail.com with the subject “I’m a Naturalista”.